There is an anteater-shaped island in the Kara Sea. It is littered with rusted vehicle parts and fuel barrels that were left there after the first wave of Artic exploration in the 1960s–1970s. Vilkitsky Island was a stopping point in the great expeditions but became a dumpsite after the state’s tasks were fulfilled. The Green Arctic organization has been sponsoring a waste cleaning expedition that has attracted volunteers from various countries for a second year. Arctic.ru presents an essay written as part of Rossiya Segodnya's Year of the Volunteer project. The 2017 and 2018 expeditions to Vilkitsky Island were organized jointly by the Russian Arctic Exploration Center and Green Arctic. The former was responsible for the scientists' work itinerary and the expedition to the island, and the latter for the cleanup. Last summer, scientists took samples of soil and water and estimated the volume of waste, and then the volunteers got down to work. "Those people had their own jobs"
Green Arctic chairman Alexei Rudkovsky explained how the waste piled up on the island. "Back in the Soviet era, the Arctic was an arena of industrial exploration, and they had their own jobs to do. Some blame them now, but I think there is no point in this. Back then, they had to open up and explore as many areas as possible and make them fit for living," Rudkovsky said. Over 70 years, they shipped barrels of fuel there for diesel generators that used 20 liters of fuel per hour. Nobody can remember now how many dozens of those generators were brought to the island. No one cared about taking away the boxing, because there was no order to do that. Now volunteers are cleaning the islands for the future explorers. "We need to restore the area back to what it was, because when our industrialists go there we will be able to say: it must remain the way we gave it to you. If we don't clean, they'll say: this is how you left it, what do you want from us?" Rudkovksy explained. Alexei Rudkovsky calls the Arctic cleaning expeditions a correction of errors. These cleaning projects have been ongoing for several years. In 2012, a volunteer team left to clean Bely Island, which is a hundred km from Vilkitsky Island. Back then, they gathered 75 tons of scrap metal by hand, but decided they could collect even more. Over five years, they have collected about 1,200 tons of scrap metal and other waste and tore down 19 buildings that weren't used anymore. Over these years, 150 volunteers from seven countries took part in the work. "We had to work with our hands"
The first expedition arrived at Vilkitsky Island on July 13, 2017. The scientists estimated there were about 800 tons of scrap metal there. Head of the Arctic Volunteers movement Yevgeny Rozhkovsky said the volunteers had to pass difficult tests to be allowed to join the team, because they had to live and work in a harsh environment and it would be impossible to ask anyone to leave the island. "People come motivated; they understand where they have to go and what they have to do," Rozhkovsky said. There are no women on the team, because a lot of physical strength and stamina is required, and even seasoned volunteers can lose several kilos during one work period that lasts 15 days. 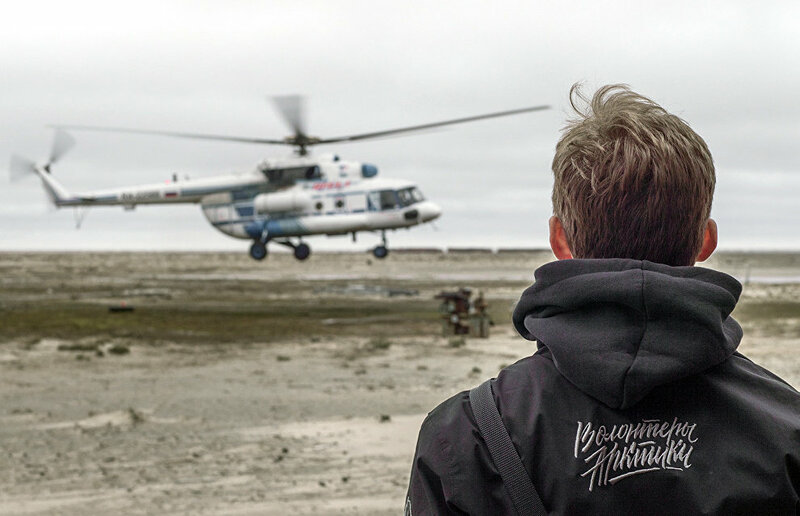 "This year, the volunteers cleaned the area around a polar meteorological station that covers about 10 hectares, the area around the military base and the entire coastline: 20 hectares in total," Rozkhovsky said. They collected over 2,600 metal barrels and 129 tons of scrap metal so that it could eventually be loaded onto a barge and taken away. Every day an EMERCOM officer was on duty near the volunteers for safety. "Bears came, but I wouldn't call it dangerous," Rozhkovsky recalls. Wild animals are not really a problem on the island, but the weather is. While people in the more moderate climate zone of Russia suffered from heat, snow was falling on the island, and the wind was so strong that the residential house was shaking. Yevgeny recalls that one day the volunteers had to work in the rain half the time and then spent the other half drying their clothes. Sometimes they had a day off and the volunteers could take a walk around the island together. This summer, volunteer Grigory Pokras went to Vilkitsky Island for the first time; but before that he went to clean Bely Island three times. He recalls that at the very beginning he wanted to get to wild nature, so he went to Bely Island to look for adventure, but after that he just couldn't stop taking part in the trips even though he had to work hard in a harsh climate. "Volunteer projects are something creative, which meets my inner needs. People with different careers, different values and interests go on these expeditions, but, despite this, all of us are united in our desire to make the world around us a little better," Pokras said. Other team members also talk about a special unity. The island has a nice working atmosphere despite the Arctic climate. "We had to work hard with our hands, and the pace of the work was very fast… By the end of the expedition my back was so sore, I really felt tired," Pokras said, adding that he was planning to go back to Vilkitsky Island next year as well. Volunteer Georgy Andreyev has been on four environmental expeditions to the Arctic and even written a small essay about it. He said that animals followed by poachers liked to visit the officially uninhabited Vilkitsky Island. For the poachers, hunting around the derelict buildings was like shooting in a range. The volunteers notified the media and the law enforcement agencies initiated criminal proceedings over the fact of poaching. Andreyev's notes also include positive recollections related to animals. For example, once they saved a wounded bear cub. "He was wounded by a poacher who killed his mother and came to our base as if he knew people would help him. <…> The poor thing was caught, pla ced in an empty house where an open-air cage was made for him; first we fed him with cereal and mixed it with antibiotics, and several days later, when the bear began to recover, we replaced the cereal with fish," Andreyev writes. Then, zoologists came to take the cub to the Perm Zoo, because he couldn't be left in the wild. By the end of the 15 days, another bear came, although this meeting was not that positive. "When we were waiting for our helicopter, the wind started blowing so strongly, that the old barracks the meteorologists left us was shaking, and one really strong gust knocked the entrance door out. A she-bear with two cubs was making circles around the barracks at the time, searching for food in the storm and the dark. We only went to sleep that night after hammering the door lock with long nails," Andreyev recalled. It would be much easier to carry out volunteer programs to clean the Arctic if funding was allocated by the state. However, according to Alexei Rudkovsky, Green Arctic has a certain legal conflict here. The federal program envisages funding for cleaning only if an area is recognized as an environmentally damaged site. For this, the site must be put on the list of the Ministry of Natural Resources and Environment, but Vilkitsky Island will never be on the list because per capita pollution is quite insignificant: the island is officially uninhabited. "The volume of waste in the Arctic will never compare with landfills, for example, in the Moscow Region. We can forget about Arctic areas being included on the list of sites with environmental damage," Alexei Rudkovsky said. However, the volunteer movement continues with donations from sponsors. Rudkovsky cannot say when all the waste will be cleared from the island. First, it is very difficult to consider all the factors, because the work is carried out in difficult weather conditions. Second, it is very expensive: renting a barge for two or three weeks alone costs 800,000-900,000 rubles per day. Selling the scrap will not pay for shipping. According to preliminary estimates, the waste will be removed from the island in two or three years. The next expedition to Vilkitsky Island is scheduled for next summer.